President Trump hosted House Minority Leader Nancy Pelosi (D-Calif.) and Senate Minority Leader Charles E. Schumer (D-N.Y.) in the Oval Office on Dec. 11. Fireworks ensued. Trump called on the Democrats to support $5 billion for a border wall as part of a spending package that would keep the government open past Dec. 21. Democrats instead offered to support $1.67 billion for other enhancements to border security. None of that is new. So the meeting played out like a ping-pong match — much of it in front of TV cameras and reporters — over which side would be blamed for a government shutdown. Making his case for the wall, Trump made several faulty claims, some old and some new, which we’ve rounded up below. He also posted some Pinocchio-worthy tweets in the lead-up to the meeting. We threw them in as well. Trump claims he can circumvent Congress by getting the military to build the wall. But there’s not a lot of room to maneuver without money. Whether it’s the military, a private contractor or anyone else building the wall, funding would be necessary. The constitution says, “no money shall be drawn from the Treasury, but in consequence of appropriations made by law.” Congress and the president must both approve appropriations. The more than 5,000 active-duty U.S. troops deployed to the border since last October haven't been tasked with building a new wall, but rather with fortifying existing structures and putting up concertina wire. Defense officials said the Pentagon hasn’t received new orders to build a wall. U.S. troops are scheduled to be at ports of entry along the Mexican border in California, Mexico and Arizona until Jan. 31. The president can order troops to build a wall, but where the funding for that would come from is unclear, defense officials said. And lawyers would likely review such an order beforehand, in part, to assess land ownership issues. The Defense Department has paid for materials and troops used during what was dubbed Operation Faithful Patriot. To Trump, opposing the wall is tantamount to not wanting any border security at all. But Democrats have offered support for $1.67 billion in security enhancements. That doesn’t include funding for Trump’s wall, but it includes 65 miles of pedestrian fencing along the Southeast Texas border with Mexico, similar to what already exists. This is a Bottomless Pinocchio claim, which is our worst rating — worse than Four Pinocchios! No segment of Trump’s wall has been built. Trump has sought $25 billion for the wall since taking office. But Congress has not given it to him. In March, with great fanfare, Trump toured prototypes of a concrete wall while in California. Congress included $1.57 billion in the appropriations bill he signed early in 2018 for border protection, but the legislative language was specific: None of the funds could be used for Trump’s border wall prototypes. Instead, the money was restricted to fencing, generally for replacement fencing. Only designs from before May 2017, such as “currently deployed steel bollard designs, that prioritize agent safety,” could be funded with the $1.57 billion. Moreover, the bill identified that the money for barriers — about $1.3 billion — could be used only for items listed as “primary pedestrian levee fencing,” “primary pedestrian fencing” and “secondary fencing.” About $250 million is for secondary fencing, meaning it just backs up other fencing. This appears to be a reference to the migrant caravans from Central America. In the run-up to the midterm elections, Trump described the caravans as a menacing invasion headed to the U.S. border. Now, he claims “many of these people are leaving now, and they’re going back to their countries” or staying in Mexico. The Washington Post’s Kevin Sieff and Joshua Partlow, who have spent time with the caravan members in Mexico, reported Nov. 28 that many of them were opting to return to their home countries. But it doesn’t appear to be a critical mass. Statistics from the Department of Homeland Security show that 5,235 caravan migrants remain in the Mexican border state of Baja California and that nearly 2,000 migrants have requested to return to their countries of origin. DHS figures also show Mexico has granted approximately 200 work visas. “Additionally, Mexican authorities have stated that 812 have been repatriated and 226 have accepted asylum in Mexico,” according to DHS. These flashy numbers don't hold water as an argument for the wall. Immigration to the United States from the southern border has declined sharply from its recent peak in the early 2000s due to a variety of socioeconomic factors. Southwest border apprehensions are down at these sectors Trump listed — but he’s comparing current rates with the immigration boom of the late 1990s and early 2000s, and his baseline is a moving target. For San Diego, his comparison goes back 23 years, to 1992, when a wall went up in that border area. For El Paso, 1993; Tucson, 2000; and Yuma in 2005, according to materials from the White House. Trump’s claim that terrorists are entering the country over the southern border is nothing new. White House press secretary Sarah Sanders has said this before. So has Vice President Pence. But it’s misleading. Homeland Security Secretary Kirstjen Nielsen said in June that “on average, my department now blocks 10 known or suspected terrorists a day from traveling to or attempting to enter the United States.” But that includes all ports of entry. And almost all suspected terrorists are apprehended at airports — not along the southern border. In a recent report, the State Department found “no credible information that any member of a terrorist group has traveled through Mexico to gain access to the United States.” In other words, Trump’s border wall would do little to stop potential terrorists trying to enter the country. The last time the federal government shut down, in January, polls showed that the public blamed Trump and Republicans more than Democrats. This is another case of Trump repeating things debunked long ago. 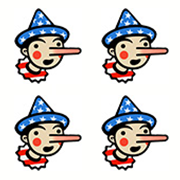 The president recently received a Bottomless Pinocchio for his claim that the wall would stop drugs from “pouring in.” Here’s our fact check on this issue. According to the U.S. Drug Enforcement Administration, almost all illicit drugs come in through legal ports of entry. Traffickers conceal drugs in hidden compartments within passenger cars or within legal cargo in tractor trailers. That’s primarily how they drive the illegal substances into the United States. They also use elaborate tunnels that cross under the border and would not be affected by an aboveground physical barrier. Fentanyl, a deadly synthetic opioid that can be easily ordered online and delivered through the mail, mostly comes from China. “China remains the largest source of illicit fentanyl and fentanyl-like substances in the United States,” according to a Nov. 28 report from the U.S.-China Economic and Security Review Commission. The World Health Organization found that, “in spite of the common perception of an association between migration and importation of infectious diseases, there is no systemic association.” Rather, there’s more risk of disease spreading from business travelers or tourists than migrants. This is, in part, because migrants at the southern border make up a small proportion of all the people entering the United States on a given day. Plus, any person seeking asylum in the United States undergoes a medical screening and examination to identify inadmissible health conditions. They also must meet U.S. immunization requirements before they apply for permanent U.S. residence. We gave Trump a Bottomless Pinocchio for claiming more than 86 times that the wall is already being built. It’s not. So this claim from Schumer is 100 percent accurate. “One thing that I do have to say is tremendous amounts of wall have already been built." “Look, we have to have the wall. This isn’t a question; this is a national emergency. Drugs are pouring into our country. People with tremendous medical difficulty and medical problems are pouring in, and in many — in many cases it’s contagious."